Four Star Leadership with General Tommy Franks is a world-class summer leadership program that allows 70 of the top high school students in the United States to have a face-to-face experience with national and international leaders. King Abdullah of Jordan, Governor Mike Huckabee, Governor Mary Fallin, General Tommy Franks, Secretary Jack Kemp, Governor Bill Richardson, Judge Andrew Napolitano, Senator James Inhofe and Olympic gold-medalist Michelle Smith are a few of the program participants over the past three years. 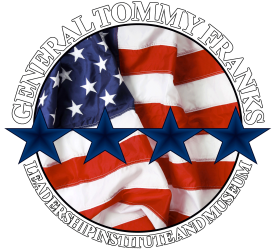 Oklahoma Christian University and the General Tommy Franks Leadership Institute and Museum are partnering to create this opportunity for our next generation of leaders. Each organization is committed to investing in the next generation of leaders and to the Four Star Leadership mission of developing the kind of leaders who can solve problems and communicate solutions that will propel our world to greater peace, prosperity and mutual respect. Students are presented with ethical and leadership challenges which they must address individually in a persuasive speech and editorial format, and collaboratively in an Ethics Bowl competition. The program includes team building exercises, spontaneous problem solving and coaching in persuasive speaking and writing. Students have an opportunity to gain scholarships, internships and much more. The program is built around General Franks' Four Stars of Leadership: character, common vision, communication and caring. Those core principles guided General Tommy Franks through a 38-year military career. The principles form a platform of discovery for the next generation of America's leaders. For more information visit fourstarleader.com.